Third computer vision digest. Your monthly portion of news in computer vision for September 2014. Feel free to leave your suggestions on interesting materials in post comments or via Twitter by mentioning [@cvtalks](https://twitter.com/cvtalks). Best links will be included into next digest! Researchers from the University of Washington prepared interesting presentation for the European Conference on Computer Vision (ECCV-2014). It is a real-time 3D face reconstruction from the video. Using the video from YouTube, the program automatically builds highly detailed face 3D-model for each video frame. This is a very impressive result, given the complexity of the problem, because the facial expressions of the human face is very complex. For emotion recognition, it is important to see the exact position of the eyes, bending eyebrows, wrinkles. The smallest error in reconstructed 3D-model is highly noticeable. 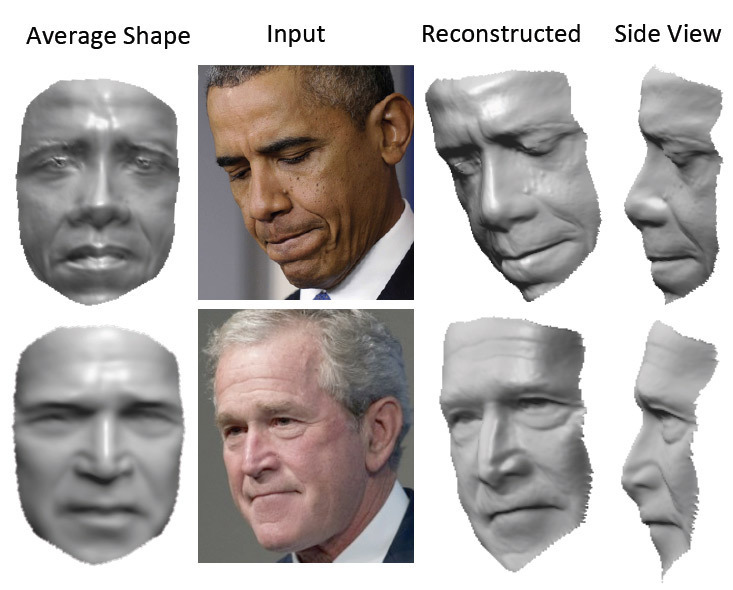 The vast majority of other programs for face 3D-tracking uses blend shapes method, when the shape of the object changes, “flowing” from one state to another. 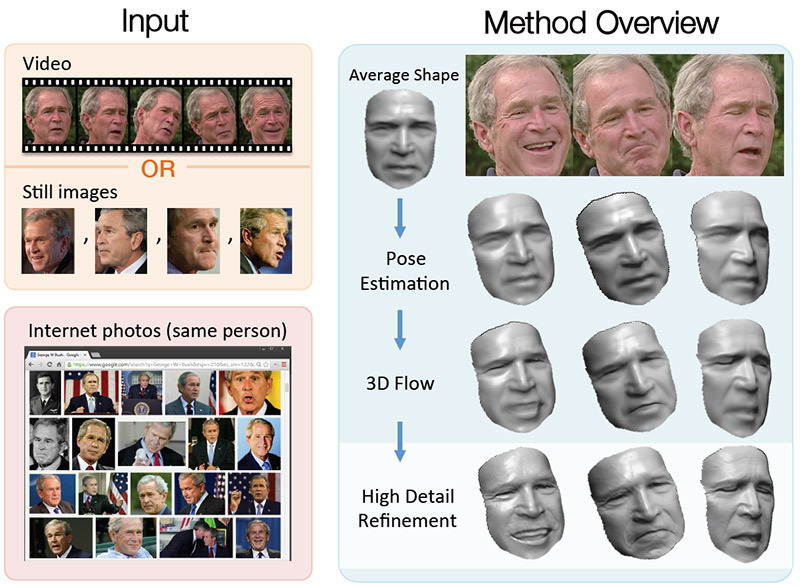 The method of smooth deformations has lack of the small details that are so important for the perception of faces. The authors of the new algorithm abandoned this approach. On the other hand, although the frame-independent reconstruction create a “separate” 3D mode from each frame, when you play on the 30⁄60 frames per second, the result should be more realistic than in the case of a smooth modification. And more. Unlike other technologies, it does not require human involvement in a test of a movie. Instead, a large archive of his photographs in different lighting conditions and poses, this method use video footrage that is tracked with optical flow (3D optical flow). Author research say that in our time for each person collected a large archive of photographs that can be used to reconstruct it’s face. A friend of mine shared a link to slideshare to the exhaustive research and analysis of color correction and contrast enchancement algorithms. How many of these have you worked with? I was impressed on how much algorithms has been developed so far. Just watch these slides, I bet - you’ll find new algorithms you’ve never heard about. Cheers to Yu Huang for collecting them for us! Math warning. Do not read this section unless you understand what damping function is and what is LevMar. I’ve found nice slides from the ECCV 2014 workshop on non-linear optimization problems that happen in computer vision. Session 1: Statistical models of robust regression. Introduction, motivations and applications. Relation to robust statistics. Occasional vs. frequent large-scale measurement noise (outliers). Low- vs. high-dimensional model estimation. Optimal vs. approximate methods. Multiple model fitting. Computational complexity. Session 2: Robust estimation with low-dimensional models. Hough transform. M-estimators. RANSAC and its variants. Branch and bound methods. Optimal methods. Fast approximate methods. Applications: Feature-based registration, multiple-view geometry, image-based localization. Session 3: Robust estimation with high-dimensional models. Robust norms and convex optimization. L_infinity-norm optimization with outliers. L_1-norm optimization on manifolds. Applications: Multiple-view geometry, large-scale structure-from-motion and subspace estimation.